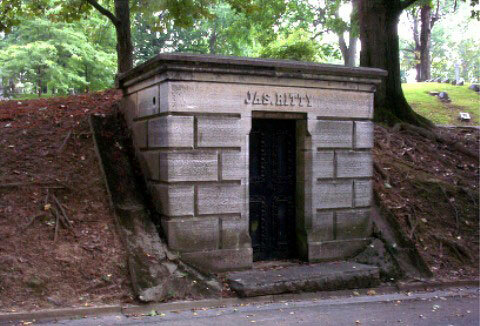 James Jacob Ritty was born in Cincinnati, Ohio, on 29 October 1836 (together with his twin-brother John) in the family of Leger (Ledger) Ritty (1792-1869) and Mary Ann Ritty (1800-1880). The family already had 2 boys: Sebastian (1827-1891) and Peter (1831-1888), and there will be another boy after the twins (Joseph, who was killed in an accident when still a youth), and a daughter (probably adopted) Louise (born 1853). Leger and Mary Ann Ritty were emigrants from the German-French area of Alsace-Lorraine (they were from German speaking part). Leger was born on 1 April 1892, and in 1819 entered the army, where he served for 8 years. In 1828 Leger with his wife Mary and just born son Sebastian and several friends emigrated to America, in order to seek a home in the new world. They settled initially for a year in Philadelphia, then in Pittsburg, where the family was reduced to poverty by Leger's drunkenness and protracted sickness. In 1833 Leger turned to God, refused drinking and purged from his sins and diseases removed to Ohio (initially to Cincinnati), where he worked as a colporteur, and later built up a considerable practice as a botanic physician (known as "Dr" Ritty), or dispenser of herb drugs, for the rest of his life. Leger was a strong man, but in May 1868, he became so much depressed in spirits, complaining of asthma, erysipelas and other diseases, that he shoot himself through the heart with his large sized Smith & Wesson revolver. In 1840 Ritty family moved from Cincinnati to Dayton, Ohio, where James attended the grade schools and the high school. He even went to medical college for a time, to study medicine, but with the American Civil War's outbreak in early 1861, he left the college and enlisted in the Fourth Ohio Volunteer Cavalry as a first lieutenant. He served honorably for three years, leaving the Union Army in 1864, having attained the rank of captain. After the army James didn't return to medicine (probably by financial reasons), but worked some time as a carpenter and a shingle maker (as his brothers John and Peter), and in 1868 he opened his first saloon at 5 Market St. in Dayton. In early 1870s he opened another restaurant and saloon, then a wine house and saloon, and then was a wholesale and retailer dealer in whiskies, wines and cigars. In 1877 he was already owner of James R. Ritty's Empire Saloon (In the same year, his brothers John and Peter opened their own restaurant and saloon not far from James' Empire Saloon). It was about this time, according to legend, that to his head came a business problem, which will make him famous (see Ritty's Incorruptible Cashier). An open-minded and intelligent man, James (better known as "Jake") Ritty was a good mixer and a man about town. He was of medium height, stocky build, with alert eyes and a drooping moustache, and was invariably well turned out, sporting an elegant silk hat. James Ritty married in 1861 to Susanna M. Norris (1844-1924) from Dayton. 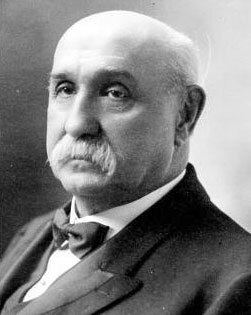 In early 1900s James Ritty retired from the bar business. He died of heart trouble in his downtown Dayton Arcade residence on 29 March 1918, and was entombed with his wife Susanna and his brother John in his family vault at Dayton's Woodland Cemetery (see the image below).